[C] Retaliate: 10x damage. Flip a coin. 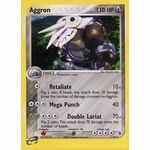 If heads, this attack does 10 damage times the number of damage counters on Aggron. [C][C][C] Mega Punch: 40 damage. [M][M][C][C][C] Double Lariat: 70x damage. Flip 2 coins. This attack does 70 damage times the number of heads. 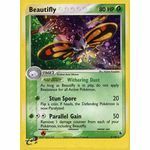 Poke-Body: Withering Dust: As long as Beautifly is in play, do not apply Resistance for all Active Pokemon. [G] Stun Spore: 20 damage. Flip a coin. If heads, the Defending Pokemon is now Paralyzed. [G][C][C] Parallel Gain: 50 damage. 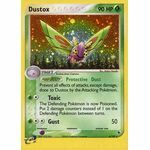 Remove 1 damage counter from each of your Pokemon, including Beautifly. [R][R][C][C] Fire Spin: 100 damage. 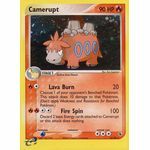 Discard 2 basic Energy cards attached to Camerupt or this attack does nothing. Poke-Power: Energy Draw: Once during your turn (before your attack), you may discard 1 Energy card from your hand. Then draw up to 3 cards from your deck. 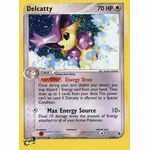 This power can't be used if Delcatty is affected by a Special Condition. [C] Max Energy Source: 10x damage. 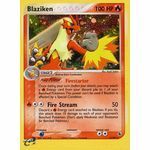 Does 10 damage times the amount of Energy attached to all of your Active Pokemon. Poke-Body: Protective Dust: Prevent all effects of attacks, except damage, done to Dustox by the Attacking Pokemon. [G][C] Toxic: The Defending Pokemon is now Poisoned. Put 2 damage counters instead of 1 on the Defending Pokemon between turns.